Testing Ask Me Anything (AMA) Is Here! We like to push the boundaries here at the Ministry of Testing. In order to do this, we do lots of small experiments, so that if we fail we do it fast, learn from it, and try something else. However, I’m excited about this new idea and hope it has a future but, as always, community engagement and your feedback will help us decide that. So with that in mind, get ready to take part in a new experiment! We are going to run an ‘Ask Me Anything’ style webinar series called ‘Testing Ask Me Anything' (AMA). It’s going to be a 60-minute webinar with a host. Each webinar will have a different guest and a loose theme. Attendees will then be encouraged to post questions to the guest in advance of the live broadcast, as well as during it. Those questions can be anything, but the host will do their best to balance questions between the theme, other testing topics, and the guest themselves. It will be a great opportunity for you to get your questions answered by an experienced tester. Last week, there was a Twitter hashtag generating a lot of traffic, namely #SpeakerConfessions. I shared a tweet as a confession about how much I enjoyed the Q&A after conference talks. I admitted that whilst speaking, I’ve rushed through my talk to increase the time for Q&A. My personal reasons are that I love the challenge of thinking on my feet and I feel it provides delegates with real value; they get to hear about things that are relevant to them. So I thought, we currently have a Q&A at the end of all our online Masterclasses, what if we tried a full 60 minutes of just Q&A? This is the AMA style! I had never heard of AMA style interviews until I shared this idea with some people at MoT. So being the testers that we are, we are going to test it! We are going to trial the AMA format, see how the community feels about it, and go from there. 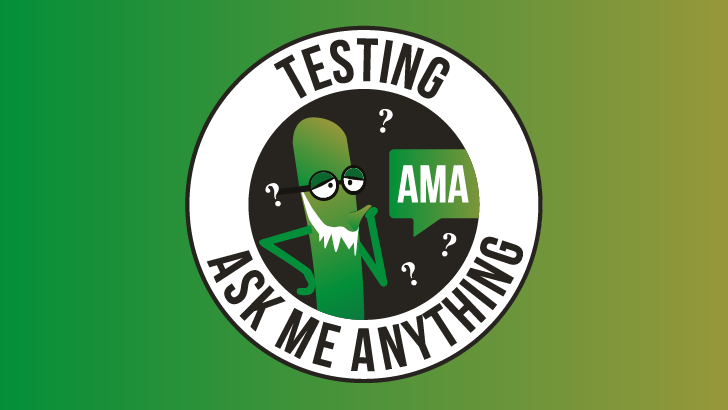 I’m delighted and excited to host the first ever live Ministry of Testing Ask Me Anything. This is a brilliant way for people to learn from amazing people in the testing community. Treating this as an experiment is a great way to see if it’s valuable. We don’t know if it will be but we’re excited to give it a try! Come join us and see what happens! The first guest is going to be me, Richard Bradshaw (aka FriendlyTester). The theme of the AMA will be Automation. A particularly hot topic at the moment, so I’m hoping for lots of questions! There is no such thing as a bad question, I’m looking for questions from testers at all stages of their testing journey… it is called Ask Me Anything after all! It’s going to be on Thursday the 7th September at 8 pm (UK). We use CrowdCast to host our Masterclasses and it comes with a great questioning feature that is perfect for the AMA format. Underneath the video feed, there is a ‘Questions & Topics’ tab. Attendees can ask questions anytime after they register, in advance of and during the Testing AMA live webinar. Attendees can also leave comments on questions and up vote questions. So I hope that by the time the webinar starts we will already have some questions, comments and up votes so we have enough material to begin a relevant and interesting conversation that benefits the community. So let’s start the experiment! Go register, post your questions and get voting!